This tutorial shows you how to copy tasks from previous years into the current year’s markbook. 2. From the column on the left (make sure the year at the top of this column reflects the intended target year – when we copy the tasks we are copying them ‘into’ the target year, circled in green below), choose the course you are wanting to create tasks for, we will use 10 English as an example (circled in red below). 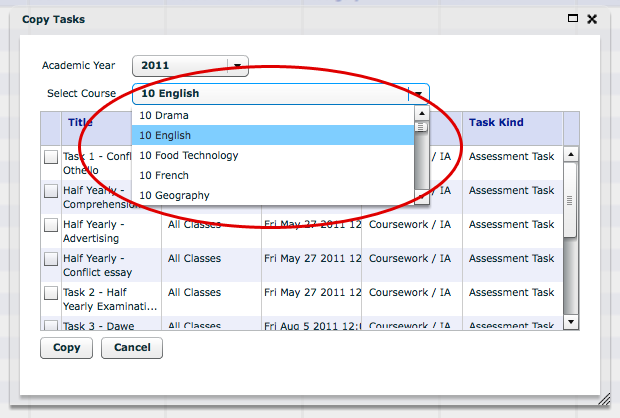 Once you have clicked on the course you want to create tasks for, click ‘Get Tasks’ (circled in yellow below). If this is the start of the year you probably won’t see any tasks to begin with in the field on the right after clicking get tasks. 3. Click on the ‘Copy Tasks’ button (circled in red below). 4. 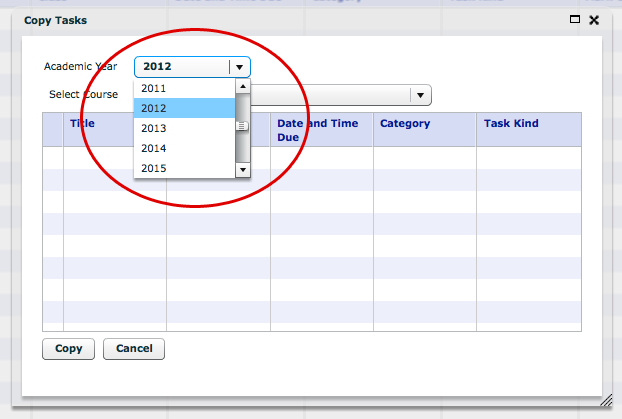 Click on the ‘Academic Year’ and choose the year you wish to copy tasks from (circled in red below). 5. The tasks will appear for the selected year and course that you are in. You can even copy tasks from other course by clicking on the course drop down menu and choosing any course you have access to (circled in red below). 6. Click the tick boxes for the tasks you wish to copy across (examples circled in red below), then once you are ready click the ‘Copy’ button (circled in orange below). Remember you can always come back and copy more tasks, or you can delete tasks if you copy too many. 7. Click ‘OK’ on the box that pops up. 8. You will notice when the tasks copy across they will have ‘copy x’ after them, x being a variable number. You will need to go into each task and edit the name of the task to remove this. 9. Revise and update the ‘date due’ – whilst they will be updated to your current year automatically; no doubt the due dates will change year to year for tasks. 11. Weightings need to be accurate when tasks are first created/copied – changing the weightings during the year will change the rankings students see on the portals and will cause issues for both students and parents. 12. It is crucial you revise the attached criteria also to see if they are still appropriate or if any wording needs updating! If you should choose to change the criteria and there are no appropriate criteria to attach, or the wordings have changed at all, please contact the Edumate co-ordinator to amend the available criteria. 13. Once you are finished, be sure to click the save button to apply your changes.